This is a pretty cool image but it looks a bit noisy. Still, I like the idea. The rainbow really stands out. What a vivd rainbow and a fortunate capture. I agree with the noise issue, and I find the droplets on the lens distracting.The horizon also appers to be tilted to the right. WHOOPS. I tilted it again. The raindrops were on the window and part of the composition. Noise is also called grain and is not necessarily undesirable. I have always used it for texture. The colours are excellent, and the contrast of dark cloud and the bright rainbow is striking. 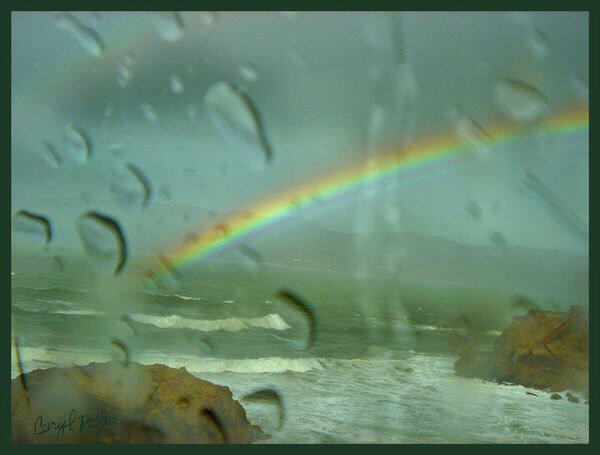 The rainbow hits the sea nicely on a third, which is strong compositionally. 1. They distract the viewer from the main focus of the image which is the rainbow - at least for me, they cause my eyes to constantly scan around the image rather than being able to focus on the obvious subject. 2. They make the image look more like a snapshot, taken in a hurry. The tilt, as mentioned by others is bothersome, and not easily correctable by rotation in photoshop without losing a large amount of the image to cropping. I also think that in general, people in this forum are aware that noise can also be called grain, and that it can enhance the artistic qualities of certain images, but were of the opinion that it doesn't enhance this particular one. Thank you so much Ben, for taking the time to write such an in depth critic. 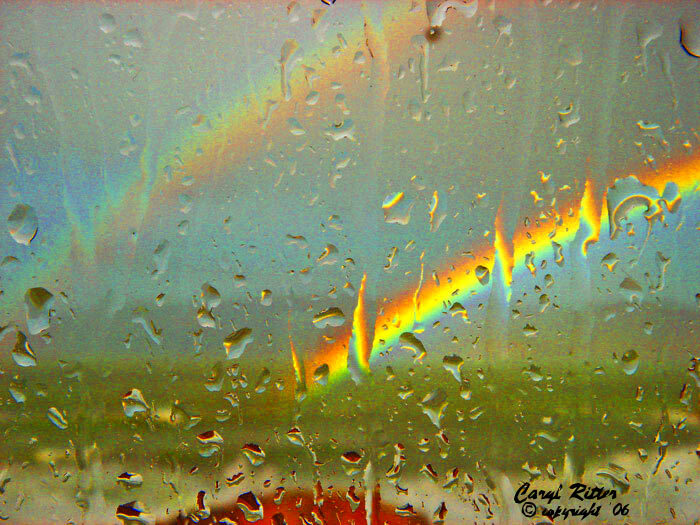 I had no choice but to take the shot thtough the window since it was pouring and the rainbow wass only there a short time. I do, however, really like the raindrops. I rarely do realistic work but tend towards the surreal and just plain weird. I am attaching another rainbow here that has lots of multi-colored noise that I actually had a choice to quiet but love the colors. However, I did get the horizon straight. I really like the double rainbows you just posted. I think the fact that the focus is on the raindrops in these makes the abstract theme work much better, and allows you (me) to just concentrate on the amazing colours and textures, without trying to work out the exact detail of the rainbow through the raindrops, which is what I found myself trying to do when looking at the earlier photo you posted. The only thing I might do in photoshop to these would be to clone out, the red object at the very bottom, or crop the bottom off completely, as I find it distracts from the amazing rainbow colours. Other than that, I have nothing for ya! Thanks again. Good point. I do not know what that red is either.